Are you trying to use Pinterest to market your small business? Then this article is for you; it explains how to get the most web traffic, customers, and/or sales out of your Pinterest for business efforts. Where possible, examples are included so you can see exactly what you should be doing. Pinterest is all about images. So seed your website with pictures – photos, infographics, diagrams – people might want to pin. Anything visual is good. A "pinnable" image will focus on your product or feature your product in a realistic setting, Pinterest for Business advises. If you feature multiple products in a single pin, limit it to four so the pin doesn't get too busy. It will also use a vertical aspect ratio (as pins are organized into columns on Pinterest), ideally 2:3 (600px wide x 900px high). Like any other social media, Pinterest is not a "set it and forget it" experience. Just creating a few pinboards and leaving them there is not going to do much if anything to generate interest in your products or services. You need to be pinning, repinning, following and commenting regularly. If you don't have the time to do it yourself, you will need to assign a staff person to do it or hire someone. When you create images to use as Pinterest pins, make use of the caption/description space available on your pins to entice your viewer. For instance, look at this board by The Cascade Team Real Estate; they're using their Pinterest caption space to give as many details about each property as they can to try and entice the buyer. And descriptions are not just good for real estate. This Cherry Vanilla Scentsy Bar pin is a great example of the kind of Pinterest caption you should use to entice your viewer to possibly buy your product; it gives all the vital information and a reason to buy to boot (10% off). Make sure that your pin includes a strong call to action. Use words such as ‘shop,’ ‘make,’ ‘find’ or 'buy'. Invite the viewer to learn more on your website or at your store. Very few of us have businesses with a huge variety of amazing products. So when you're trying yo use Pinterest for business, don't create boards that are only filled with photos of your products; it makes for a boring set of boards that generates little interest with visitors. Instead, create pinboards and pin photos of things that are related to your products. This gives you the scope to be much more interesting and relevant to your customers. Suppose, for instance, that you sell blinds. Boards with photos of different types of blinds on different windows is an obvious choice. But you could also create pinboards that show different rooms in a house and the different things that can be done with them, because people who are interested in buying blinds are probably also interested in home décor. You might have a board called Baby's Room and another called Guest Bedroom filled with to-drool-over shots of beautifully decorated rooms - all with blinds. Some other examples – a hair stylist would presumably have pinboards showing the hairstyles he or she can create but might also have boards on hair accessories, nail art, shampoo products and celebrity hairstyles. A bike shop would have boards on bikes of course but perhaps also boards on great places to bike. Think not "What products or services do I have to sell?" but "What related interests do my clients or customers have?" and create boards accordingly. Remember that Pinterest is social media. In other words, people expect to see and learn more about the people behind the scenes in your business and perhaps even connect with them in some fashion. 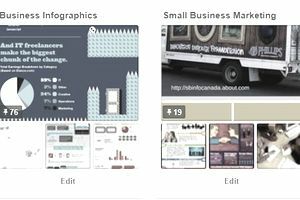 So you want to work a personal element into your Pinterest for business activities. One way to do this is to create boards relating to the personal interests of the people who work at your business. Suppose that at your company, one partner loves sailing while another loves golf. Your business could have boards on both of these as well as your products. Another is to create pinboards centered on your customers. Boards filled with photos of satisfied customers or photos of customers using your products can really increase customer engagement. And a third is to create boards relating to a cause that your business espouses.For instance, a financial services company heavily supports the local symphony; they could have Pinterest boards depicting people and scenes from the annual events they sponsor. 6) Integrate Pinterest with the other social media you use for your business. Don't bother sharing every pin you create. The best practice is to make occasional posts that give your Facebook or Twitter visitors a reason to follow the link. What I wish my home office looked like. Clicking the link will take you to my Pinterest board of photos of other home offices to die for. Add a photo there or here if you like. And if you're on Pinterest yourself, let me know in the comments below so I can drop by and visit your boards. Besides being more interesting to begin with than a post that just posts your pin, you can use your Pinterest for business post to drive customer interaction. In my Home Office Inspiration Board post, for example, I ask visitors to post their own office photos and share links to their own boards. I could have done a poll asking what shape their office was in, a fill-in-the-blank question related to home offices – there are so many engagement possibilities! 7) Use available Pinterest tools to increase your reach. Pinterest has developed a suite of tools to help those using Pinterest for business to sell their products. Here are some you'll want to explore. Promoted pins are ads. They look just like regular pins but you pay to have them seen my more people. You can either click the Promote button on any pin or click on the red button with a white plus sign on the top right of your Pinterest page to create an ad. Pinterest offers both pay per click and pay by 1,000 impressions advertising. Buyable pins let you sell your products right on Pinterest. Customers can just tap to buy, paying with Apple Pay or a credit card. Pinterest analytics will give you insights about how people are responding to your pins so so you adjust your strategy to get more clicks or impressions from your Pinterest marketing.